Make the most of your membership by getting involved!Your expertise makes the Association run! “The best way to make the most of your membership is to get involved.” The association is always looking for new ideas from its members. 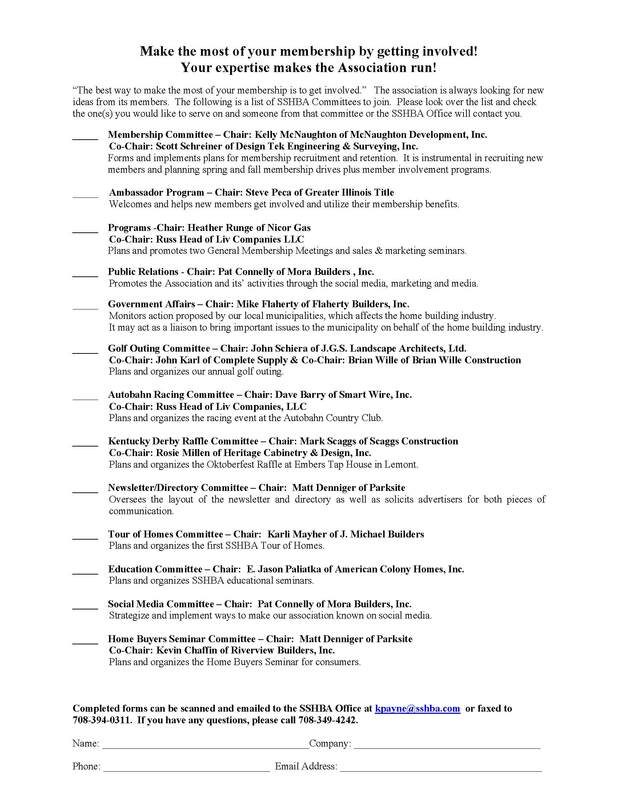 The following is description of SSHBA Committees that are available for you to join. If you are interested, please fill out the form below the descriptions and someone from that committee or the SSHBA Office will contact you. Forms and implements plans for membership recruitment and retention. It is instrumental in recruiting new members and planning spring and fall membership drives plus member involvement programs. ​Plans and promotes four General Membership Meetings, including finding topics, speakers and sponsors. Also responsible for getting sponsors for the speaker for the four GMMs. Promotes the Association and its’ activities through the media. Monitors action proposed by our local municipalities, which affects the home building industry. It may act as a liaison to bring important issues to the municipality on behalf of the home building industry. Click here for further information on this committee. Plans and organizes our Spring golf outing. Plans and organizes the racing event at the Autobahn Country Club. Plans and organizes the raffle. This year it will be Kentucky Derby themed. These are ​the most important communication tools of the SSHBA. The Newsletter Committee determines the layout, design & solicits advertising for the Southern Exposure Newsletter. The annual Directory Committee designs the directory & solicits advertising for the publication. Plans and organizes the SSHBA Tour of Homes. Plans and implements ways to make the SSHBA presence known on social media channels. Plans and organizes educational events for the SSHBA. “The best way to make the most of your membership is to get involved.” The association is always looking for new ideas from its members. The following is a list of SSHBA Committees to join. Please look over the list and select the one(s) you would like to serve on and someone from that committee or the SSHBA Office will contact you.